Welcome to this year’s favorite Christmas gift picks for 2018! As always, all the pictures below are direct links for ordering- just tap and it will open in a separate window. Over the course of the year I’ve found myself thinking a lot about the “why’s” of toys. When I think back to my own childhood, I still see the toys that were most dear to me and I realize what a powerful way toys have of shaping childhood and our childhood memories. It’s no secret that I love beautiful toys. Of course toys for aesthetic sake aren’t as meaningful if they aren’t also beloved and played with by the children for whom they are purchased. Many of you know that we are a homeschooling family. Taking on the task of home education constantly makes you think and re-think through the question of “why we do what we do?” This nagging question can be both a blessing and a curse. The blessing is doing things with intentionality. The “curse” is laying awake at night wondering if you’re doing the right thing or enough of the right things. One thing is for sure, with having children at home full-time, you become quickly aware that you are in charge of their every waking moment and the gate keeper for how they will spend those moments. During childhood, I want to be the main voice influencing how my child’s affections are ordered. I want to be able to show them what I think is worthy, what carries truth, beauty and goodness and why. Toys are synonymous with childhood and I think that they can be an extension of your family’s values. It’s important to me that my children have a rich interior life and I want to provide books and toys that feed curiosity, wonder and imagination, rather than distract from the important work of childhood. You’ll see more items below still focused around Little House on the Prairie since it is still a big deal around here. Laura Ingalls Wilder has a lovely quote, “Home is the nicest word there is.” I think there’s much for us all to learn about the essence of home and how to carefully curate the things within it (toys included) which speak of the things we hold most dear. Regardless of your schooling path, I hope you find an inspiring toy, or two, to put under your tree this year. A toy to spark new worlds of imagination to explore. Look around at what you already have in your home and don’t be afraid to ask yourself “why?” Spend some time contemplating what you’d like to see more of in your home and if there are toys that add value to what matters most to you. I feel like we once had it all- the valuable and worthy toys… as well as all the rest. Over the last two years, we have whittled down our toys to what reflects our family’s values. This year I want to share with you what’s been most enjoyed in our home. Laura is still a big deal around here. Holiday received several Little House themed gifts for Christmas last year. Her Easter basket for 2018 was Little House themed and her 8th birthday party, just a few weeks ago was (you guessed it) Little House themed! How did she start loving all things Little House? Why books of course! I’ve featured them before, but they bear repeating. The My First Little House Books are simplified stories taken right from the original Laura Ingalls Wilder series. 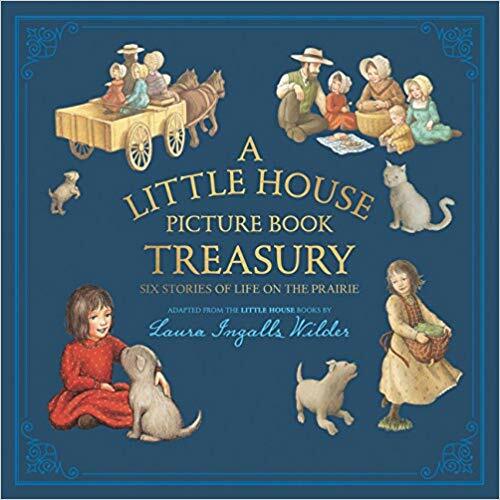 While we love the individual picture books, “A Little House Picture Book Treasury” is a collection of 6 of the 13 My First Litttle House Books stories. This is one of my favorite books to gift little ones! Holiday still loves these first picture books. I think that being familiar with those main stories made moving into the chapter books even more enjoyable. I will say that some of the chapter books have very long descriptions of everyday chores. If your child isn’t into listening or reading these, you may want to try the audiobook version. We LOVE the Little House series narrated by Cherry Jones! Follow Link HERE. Research shows that when children’s hands are busy while they’re being read aloud to (or listening to audio books) they are actually able to engage with the book more easily. From all of this Little House reading, Holiday has loved to play with her Little House toys. Holiday with her cousins, Emme and Eliza, doing laundry the pioneer way! There’s a local farm we love to visit that has a clothes washing staton and clothesline set up for children to play. ALL of the kids love to wash clothes, so we made our own old-fashioned washing station at home. We have a retractable clothes line that’s attached to Holiday’s outdoor play house which can be attached to our fence. Add to that some clothespins, an old fashioned washing board, a big galvanized tub and a bar of Ivory soap and they’re all set! This is a super fun hit at our house with all the kids! All the adorable pioneer girls costumes are from Kelly’s Costumes on Etsy. She makes matching doll versions too! I have purchased quite a few costumes from her shop and her craftsmanship is impeccable! Link to Kelly’s Costumes HERE. I’ve featured this barn playset on my blog many times and it is STILL one of the most played with toys at our house! 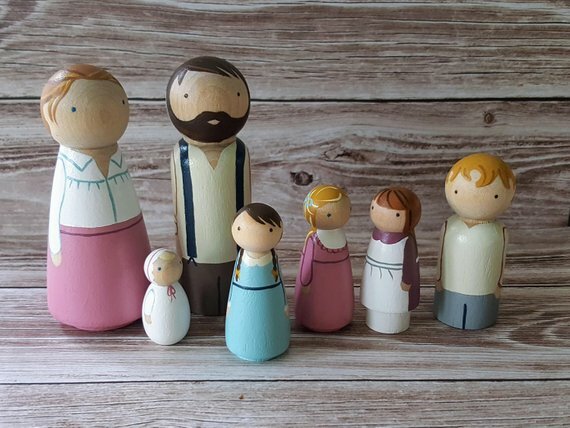 Holiday used it constantly to play Little House on the Prairie with so I was ecstatic to add the adorable Ingalls peg doll family (below). The barn is from Jacob’s Wooden Toys (via Etsy). The doll set is also from a very favorite Etsy shop, My Pretty Peggy. For Holiday’s 8th Little House birthday, her big gift was a dollhouse-sized version of the Ingall’s family prairie house. This set comes with a gorgeous set of furniture that’s very well made. Since we already had the peg dolls, you can request to purchased without their included crochet version which translates to a significant savings. The dollhouse is from ImagineNationShop on Etsy. 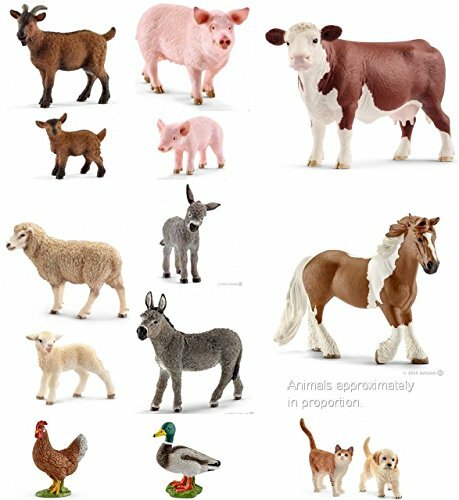 For animals for her barn, the Schleich and Terra brands are the perfect scale. Target generally carries Terra on an end cap in their toy department. Schleich are readily available on Amazon. Another gift Holiday received for her birthday was this covered wagon from Ostheimer. I AM SO IMPRESSED BY THESE OSTHEIMER VEHICLES!!!! So much so that I HAD to say that in ALL CAPS! Seriously! They are so well designed and sturdy for children. If you want to hook up horses to the covered wagon, you will also need the harness piece listed below. Some retailers include the harness piece automatically with the wagon and other sell it as an individual item. The harness works with the tractor, horse box and other Ostheimer vehicles with which you’d want to attach animals. The harness is easy enough for little ones to attach and is ingeniously designed to be sturdy and work well. I like that you can still easily pull and push the wagon around with the horses attached. I was so impressed with the covered wagon, I decided to go ahead and order the horse box and tractor as Christmas presents for this year for her. All the Christmas stories from all your favorite Little House books in one place! Hearing about all of Laura and Mary’s sewing, crafting, and cooking responsibilities has been very inspiring for Holiday. We started last year with this sewing board from another favorite Etsy shop, FromJennifer. NOTE: I will feature several things in this blog for FromJennifer. ORDER FAST! Her shipping cut off is THIS WEEK on Saturday, November 17th for guaranteed Christmas delivery! Melissa and Doug has these super cute, no-sewing-required, blanket kits in two color ways that are another favorite gift for the year! My resourceful friend and neighbor, Erin gave me a heads up about this awesome children’s sewing machine which Holiday received as a gift from my parents for her birthday. It is a very nice quality, full functioning sewing machine- an excellent choice for beginners! It comes in three adorable colors to choose from! 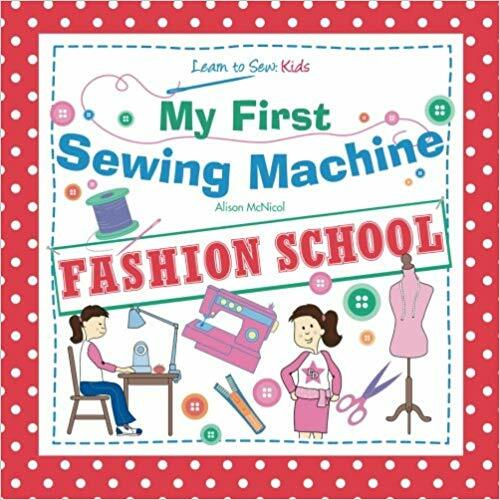 Some great books to get your started on your sewing journey! Little House in the Big Woods goes into detail about Pa and Mr. Edwards building their log house. Lincoln Logs are the perfect way to extend imagination. They really are the original STEM toy! The more we’ve played with them at our house, I realize what a great toy they really are. It takes some engineering gray natter to thing through how to balance and build sturdy structures with Lincoln Logs. One of our favorite family vacation spots in Big Cedar in the Ozarks. In the registration building there, they have a giant Lincoln Log table. Holiday always loves that as our first Big Cedar stop and has commented many times how much more fun it is to build when there is a plethora of the bigger building pieces which can be scarce in the individual sets. Upon our return from our latest Big Cedar trip, I purchased THREE of the anniversary Lincoln Log sets and then combined them into this adorable caddy from Magnolia Hand and Hearth for Target. This Magnolia Hearth and Hand Caddy is no longer available on Target.com, but is still in stock in many stores and ON CLEARANCE for less than $20! Check here to see if it’s at your store! I specifically like this particular set of Anniversary Lincoln Logs because they have all wood and only wood pieces. Many of the more modern sets have plastic pieces included— so instead of building the roof with individual wooden pieces, it’s all just one, big plastic piece (insert two thumbs down here). We are all about books here and we love the classics. Penguin Books has been producing the most beautiful versions of the classics. 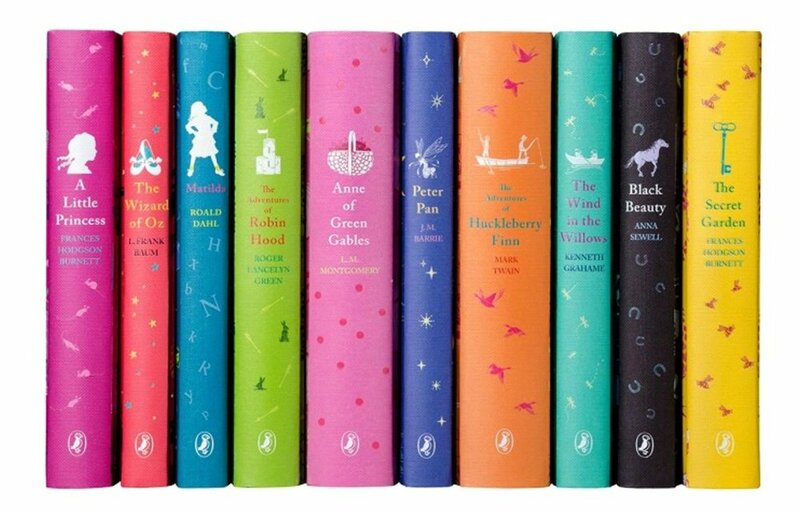 Their children’s classics often go by the name Puffin Classics. These are books that are meant to stay on your shelves forever. They are scattered all through my house and bring me so much joy every time I see them! These titles can be purchase individually or in the boxed set. Again, one of my go-to Etsy shops, MyPrettyPeggy has this irresistible Anne and Diana set (with the option to buy Gilbert too). I’ve had my eye on this Anne of Green Gables costume for quite some time for Holiday. I ended up reaching out to Kelly’s Costumes and she made me a custom Anne outfit which will be under our tree this year! Link to Kelly’s Costumes HERE . NOTE: I purchased these cute boots to match Holiday’s Laura Ingalls and Anne Shirley costumes from Khols! The first book in a new early reader Anne chapter book series by Kallie George just released a few months back! Follow her work to see when more books will be added to the collection! I will say that Holiday has read the unabridged, full Anne of Green Gables, but was still SUPER delighted with this easy picture/chapter book version. We have become a hot tea family through and through. As part of our homeschool week, Holiday and I have regular Poetry Teatime. We read and recite seasonal poetry and picture books. We love all things Beatrix Potter and so when I went on the hunt for a “real”, fancy, porcelain tea set, I couldn’t pass this one up! This is considered a child’s tea set and comes in three sizes. I ordered more than one and can attest, you want the large size. Even the large size is still child sized, much smaller than this and it’s virtually unusable for real tea. If you think your little ones might not be into real tea, this one is the favorite of our entire family! (At the time of creating this blog, my favorite flavor is showing as unavailable on Amazon, though I order in there every few weeks. I’m confident it will be back in stock very soon!). This bow and arrow set is a repeat on the blog, but it is one of THE most popular toys at our house and one of my go-to birthday gifts for cousins. This is also from Etsy shop FromJennifer I mentioned above. REMEMBER- you must order by Saturday, November 17th for guaranteed Christmas delivery. Her bow and arrow sets come in two sizes, we’ve only purchased the large and it has been perfect for ages 6-11. We usually order the large bow, quiver and some extra arrows as well. The quiver is well made and super functional— plus it comes in lots of great colors! The Orboot Adventure Globe is a gift Holiday will receive for Christmas this year, so I don’t have my usual long list of wonderful things to say about it YET! It is, however, well reviewed and I can see it being something she will really enjoy! I probably would not buy it if it were the only globe in our house as it does not have countries and other details without the app. This is the regular globe we have and use often. I am SO excited to tell you all about Letters From Afar! I’m convinced this is THE best kids subscription out there right now! Each month your child will receive a gorgeous hand-lettered, old-fashioned, snail-mail letter from Isabelle as she travels the globe. It is such a vibrant and living way for geography to come alive to your kids. She writes in a way that truly captures the imagination, you will feel as if you’re walking the city streets, seeing the sights, hearing the sounds and smelling the scents on each of Isabelle’s adventures. We have a special binder that’s just for all of our Letters From Afar. I use page protectors so all our letters can be enjoyed time and time again. Each letter also contains two international stamps to add to your travel collection! You can get all of the details and sign up for Letters Afar by clinking this picture below! Last year at Christmas we had a little cousin gift exchange game and this little Magic Tricks set was one of the gifts I had picked up from Costco. My niece ended up winning this one and it turned out to be THE fan favorite. My niece along with all my nieces and nephews have played with this set ALL year long. I was so excited to see Costco still had some out this year amongst their Christmas toys! It’s not available through Costco’s website, so I don’t have a specific link for you, but definitely check for it in stores! This magic set IS available on Amazon and is highly reviewed, so might be a good alternative to the Costco one! What’s a magician without her hat?! Check out this super cute magic set from Melissa and Doug! Two more items we’re excited about over here, but didn’t really fit into any of the above categories! Holiday received this eukelele for her birthday and has been loving it (as has my husband!) We downloaded an app that teaches you to play along to many popular songs. It comes in a variety of super fun colors and it a relatively easy instrument to pick up! We are big fans of American Girl. I don’t usually post a ton of AG items on my gift blogs because it’s just something you’re into or you’re not! However, I feel like this new remote control car from AG is an AWESOME gift idea no matter what kind of dolls or stuffed animals your kids like to play with! I was surprised when I first saw this car in person that it’s not as big as I was expecting which is a GOOD thing for us! We are maxing out on doll space, but I thought this one was just too awesome to pass up! It fits two 18 inch dolls (or stuffed animals of your choice)! Just wanted to share a couple of my favorite gifts this year for the littlest ones on your list! Dimpl toys are the favorites of babies far and wide. There are two versions to choose from- the original Dimpl (second picture) and this great new one that has colors on one side and shapes on the reverse. How can you NOT love these puzzles from Fat Brain Toys to order through Amazon?! I’ve ordered MANY of these for gifts already and everyone has gone crazy over them! You can order any name up to 9 letters for one flat rate price. THE MOST AMAZING BABY BIBS OF ALL TIME!!! When Holiday was itty bitty, I stumbled across these bibs and they became a fast favorite. These days, I buy them for every single baby shower I go to! Without fail, six months down the road, the mom calls me and asks where she can get more of these bibs because they are SO handy and so super adorable! Kamani Designs on Etsy makes a really fantastic product. She doesn’t have them currently listed in her shop, but you may still be able to get one of her art smocks— Holiday is still using hers five years later. I also love and regularly gift her splat mats— perfect for all your messy memory making at home! Last, but not least, my go-to gift for all the little boys! I’ve gotten rave reviews from all the moms and they’ve said their older boys (and girls) have been just engaged with this set as the younger ones! Maybe this set will be a hit under your tree too!